The Vikings swarmed down the River Soar and invaded Leicester in 868, partly destroying the ancient Roman city walls and within the next ten years, Burhed, King of Mercia, was defeated. In 886, the losses of Anglo-Saxon territory in Mercia were clearly defined by a treaty that gave the Danes a permanent ‘country’ within England known as the Danelaw. Leicestershire fell within this territory and when the city’s Bishop retired to satefy at Dorchester-on-Thames, churches were destroyed and Christian rites trampled. Leicester, as a former Anglo-Saxon royal city, continued its importance under Danish rule. Although short-lived, the existence of the Danelaw left an everlasting mark on Leicestershire. Despite this, there aren’t many archaeological finds to be seen; visible remains of the Norsemen are hard to come by. Leicestershire’s archaeological record lacks burials, pottery and everyday implements. Finds that we do have are generally personal ornaments such as brooches, horse accessories, coinage and weaponry. Place-names show the extent of Danish-occupied Leicestershire with 56 villages ending with –by, half of which contain a Danish personal name as their other element. The sounds of the Scandinavian invaders gives way to names of an older Mercian originwith names ending in -ton. Thrussington, Syston and Cossington all speak of an earlier period in Leicestershire’s settlement history. Even though the -ton element suggests the presence of a settlement that survived the impact of the Danish army, the first element in these names is frequently a Scandinavian personal name. This article explores the history of the village of Humberstone and mounts evidence for its origin as a Danelaw settlement with new place-name interpretations and a fresh look at local legends. For the first time I also attempt to decipher the meaning of a collection of stone reliefs that, until now, have an unknown origin, an unknown meaning but clearly predate the Norman church they are incorporated into. To the north of Humberstone village, next to a roundabout and close to the Porsche Garage, is a standing stone – Leicestershire’s only ancient monolith known today as the Humber Stone. Throughout history the stone has gone by many names, Humber Stone being the most recent, named after the closest village. The village being named after the stone is a common misconception. A hundred years ago the stone was called the Hoston Stone, but it has been called many things through antiquity, including the Holstone, the Holy Stone the Hell Stone but another ancient name for it is Hel Stone. Interestingly, about 100 yards to the north-east of the stone was a plot of land known as Hell Hole Furlong. 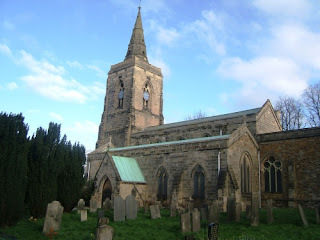 Its exact location is recorded by Alice Dryden in her book Memorials of Old Leicestershire. Dudley refers to Hela as Saxon, but Hela is a derivative of Hel, the name of the Norse underworld and also the name of the ruling goddess of the underworld. But why would the stone have this association? The key here is the name of the furlong – ‘Hell Hole,’ which would assume there was a hole, or cave, nearby. Hel is the perfect name for a cave discovered (or created) by the Vikings – a real life underworld in the conquered landscape. Sadly no underground cavern has ever been discovered but there is an old legend from the English Civil War that says that one did exist. The tale says a group of Royalists were captured by the Roundheads and imprisoned in St Mary’s church in Humberstone village. They escaped from the church via a secret passage to emerge in a field just by the Humber Stone. When the Roundheads finally discovered the stone, they levered it over the entrance to the passage to stop anybody from following them. The cave may well have had a Celtic origin but it is easy to assume that it was subsequently reused and renamed by the Viking invaders, as the underworld Hel. The fact that there was an ancient tunnel in the landscape would have been important to the Vikings who may have viewed the land as a possible representation of Hel for religious and ceremonial purposes, and therefore an important location to settle in. There are a number of caves underneath the city of Nottingham but whether such a cave system exists in Leicester, or indeed Humberstone, is unknown. A geophysical survey may well clear this up. What we do know is that the nomenclature of Leicester’s only remaining monolith, and a patch of nearby land, was once named ‘Hel/Hell.’ After ‘Hel’ the stone became the Holy Stone (most likely after the re-Christianisation of the land), then Holstone, followed by Hoston and most recently the Humber Stone. The name Hel and Hell in Humberstone are likely to originate from the times of the Danelaw when a nearby Celtic cave was named after the Norse underworld, Hel. 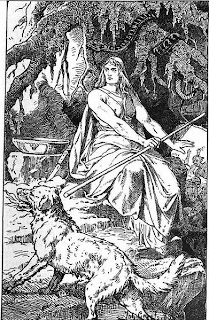 The stone, which stood close to the cave’s entrance, could have possibly been seen to represent the guardian of the underworld, the goddess Hel and the name remained preserved in village folklore. If the standing stone and ancient cave were so important to the Vikings, you’d expect to find a settlement nearby. This brings me to Humberstone village. Humberstone has a long history; it is mentioned in the Domesday survey of 1086 but present thought doesn’t take it back to the time of the Danelaw. Even though the author is uncertain, he states that the origin of the village name is Hunbeorht’s Stone. Cox is an authority on Leicestershire place-names but where the evidence for Hunbeorht’s boundary stone theory comes from, I am unsure. Hunbeorht was the Bishop of Elmham who died around 856 but there is no known connection between him and the village in question. Therefore, the place-name can only be viewed with conjecture, not certainty. I would suggest that the origin of the place-name is more likely to arise from the county’s Danelaw era. Due to the very few relics attributed to the Danish invasion in the archaeological record the bulk of the evidence for a substantial Danish settlement comes from place-names. Every village that ends in –by, -toft or –Thorpe, for example, have a Danish origin. Many villages also used a Scandinavian first element with the English habitat element –tun, for example Thurmaston. This would infer villages taken over by Danish newcomers and hence renamed. Many Leicestershire villages were named after powerful gods and famous Danes. Oadby is named after Oadby and Thurnby comes from the god Thor. Two villages close to Humberstone, namely Hungerton and Ingarsby are named after a powerful Danish leader called Ingwar Ragnarsson (also known as Hingwar and Ivarr the Boneless). Ingarsby literally translates to Ingwar’s Village. 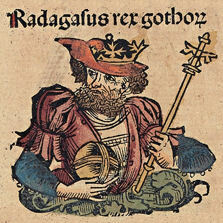 Ingwar was a prince, son of Ragnar Lodbrok, ruler of an area probably comprising parts of modern-day Sweden and Denmark. Ingwar had a brother called Prince Hubba Ragnarsson (also known as Ubbe and Huber). 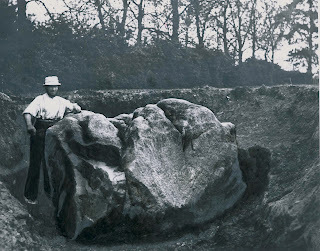 Some scholars believe that the name Humerstane may originate from Hubba’s Stone. Interestingly, the surname ‘Huber’ gave rise to many variants due to varying dialectal pronunciation, and one such variant is ‘Humer,’ Therefore Humberstone’s original name, Humerstane, literally means Hubba’s Stone (or Hubba’s boundary stone). Hubba, like his brothers, was an extraordinary character who led the Viking warriors across England and Wales as they successfully won battle after battle against the Saxon defenders. To understand why Humberstone would be named after Prince Hubba, it is worth understanding his importance in Viking history. 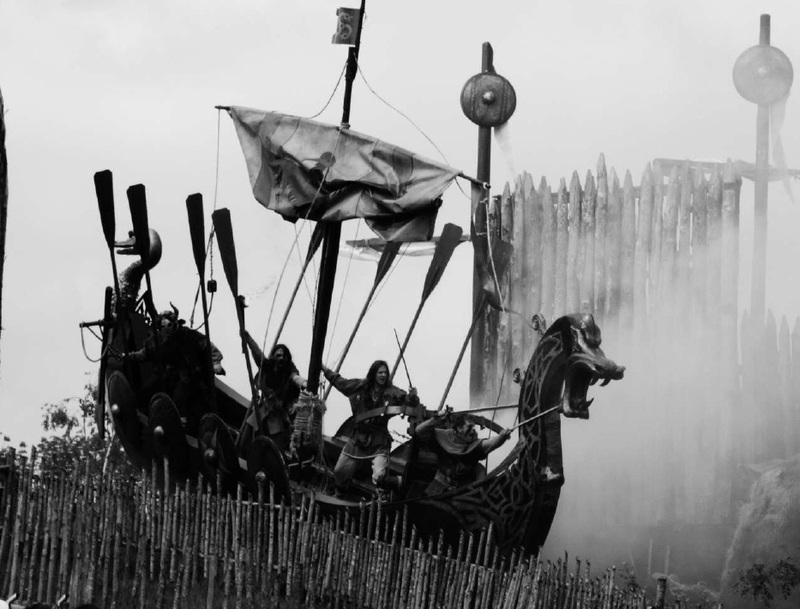 It all began in the autumn of 866 when Hubba, with his brothers Halfdan and Ingwar led an enormous Viking army across the sea, landing in East Anglia to avenge the death of their father Ragnar. There they set up camp, fortified their position and waited for reinforcements. In February 867 they marched inland and seized York. Ingwar set up a king clearly showing that his goal was conquest, not plunder. From there, Ingwar and Hubba went south into the kingdom of Mercia, collecting huge swathes of land along the way. The Mercian King Edmund made a disastrous assault on their entrenchments at Thetford in November 870. Edmund and was captured and asked to forsake Christianity and serve as a vassal under Ingwar and Hubba in return for his life. He refused. He was then tied to a cross and used as an archery target. Leicester would have been the frontier fortress to the Saxon boundary is bordered and it is highly likely that Hubba’s famous flag, the Raven Banner, would have been hanging from the city walls to strike fear in their opponents. The banner was said to have been woven in one noon by the sisters of Ingwar and Hubba, when the warrior princes departed from their homeland to avenge their father’s death. The banner, which displayed a raven, was said to appear before every battle and fly like a living bird if the Danes were victorious, but hung down motionless is they were defeated. After taking Leicester the brothers continued to ravish the country and they even joined up with their fourth brother, Guthrum, but in 878 things started to change for the worse. One night a Saxon army near Devon, led by Odda, their alderman, silently travelled to Hubba’s camp, slew him and many of his warriors. This became known as the Battle of the Raven Flag as Hubba’s famous Raven Banner was captured by the Saxons. The tide was beginning to turn and soon afterwards Ingwar was killed while invading Ireland. The slain princes’ successors, Halfdan and Guthrum made a credible stand against Alfred the Great but they too failed. Halfdan’s fate is unknown but Guthrum gave in to King Alfred and was even baptised into Christianity. Alfred even became Guthrum’s godfather and soon, a pact between the Vikings and the Saxons would be signed. Hubba left many traces of his remarkable marches. His rapid and extensive movements across England and Wales, and his penchant for camping upon and fortifying high places, has been of great interest to archaeologists and historians. Hubba and his brothers were mighty leaders, Viking heroes, and settlements named after them appeared across England and Wales, probably in the places they had settled during their conquest. For Hubba in particular seven historic eminences have borne the name Hubba’s Hill and the town of Hubberston in Pembrokeshire was also named after him. Like the seven Hubba’s Hill locations, the standing stone of Humberstone also stands on an eminence and has been a landmark in the East Leicestershire landscape for 440,000 years due to its origin as a glacial erratic rock, i.e. deposited from a glacier during the last ice age. When the Vikings invaded Britain, the landscape at Humberstone, with its very own underworld and stone guardian, would have been the perfect place to settle. If the subterranean tunnel was already ancient, as the Reverend John Dudley believed (Celtic), then it is plausible that the Viking settlement would have been built at the locality where the tunnel culminated – the present day Humberstone village. With such an important, almost ceremonial landscape, the settlement would certainly have been named after an important figure, and during the Viking invasion nobody was more important than the mighty conqueror, Prince Hubba. The ancient monolith may have been given the name of Hel after the goddess of the underworld, but the important, iconic landmark was claimed by Hubba; it was the Hel Stone, but it was Hubba’s Stone and so the ancient village took this name. There is yet more place name evidence which alludes to a Norse origin in that in 1205 Humberstone was recorded as Humbrestein. Steinn is the Old Norse word for stone. As already stated Humberstone’s name at Domesday was Humerstane and therefore we could assume that the -stane element may well have been recorded phonetically by the Normans. -Stane and -stan appear as place name endings at various localities throughout Britain and are interpreted as late Saxon, but there is some body of thought that they originate from the Old Norse -steinn. Whatever the truth, during the 13th century, the village name seems to have retaken its original Scandinavian element of -stein. Interestingly there is an ancient meadow in Humberstone once known as Steine Meadow and this gave rise to the street name Steins Lane which remains to this day as a continuance of Main Street. Don't miss Part 2 of this fantastic research, which focusses on some fantastic archaeological discoveries in the village. Click here. What are the chances of investigating your theories? Geophys would be interesting!